Address:Twilfit House, 1 Jervis Street , Dublin 1. A visit to one of Ireland’s top family attractions The National Leprechaun Museum which is located in the heart of Dublin, is an opportunity to step into another world where nothing is quite what it seems. You are taken deep into Celtic culture to discover what really lies behind tales of leprechauns, rainbows and pots of gold. 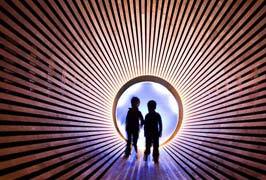 The National Leprechaun Museum is the first ever family attraction dedicated to Irish mythology and opens up a fun and magical world full of fascinating folklore, mythology and enchanting stories. A fairytale for adults and children alike, this captivating and interactive experience takes you to the heart of Irish cultural identity and imagination. The museum is structured like a story, with 12 chapters each transporting you and your family to the heart of Irish cultural identity and imagination. Each chapter represents either a part of Irish mythological history or recreates an experience typically associated with leprechauns. The result is a series of captivating, interactive experiences – from the first ever sighting back in the eighth century, through to modern day representations of the leprechaun in film and popular culture – with plenty of adventures in between. Experience what it’s like to live in a leprechaun-sized world and journey to the end of the rainbow to see if the elusive crock of gold really exists. 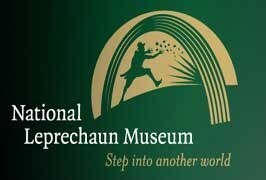 Family Fun Tip:- Did you know that a leprechaun is a character of Irish Mythology. He is about 2’6″ (75cm) tall. He is very rich but extremely tricky and if you catch one don’t take your eyes off him, or he will disappear! He is a very slick talker and loves a bit of fun. The Museum is fully wheelchair accessible with level access throughout and disabled toilet. There is a small shop in the resource room which stocks a range of books on Irish folklore and mythology and other publications relating to the content of the museum. Unique art and craft items produced by Irish craftsmen are also available, in addition to other small items suitable for children. The resource room also houses a library of books and further information to read while here, materials to draw pictures for their gallery and a small selection of light refreshments. 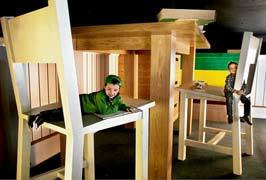 The National Leprechaun Museum is an ideal location for school trip. as they offer an interactive environment of learning and fun. They will take your students deeper into Irish and Celtic culture to discover what really lies behind the well-known tales of Irish cultural icons – leprechauns, rainbows and pots of gold! You and your students can feel what it’s like to journey deep beneath the rocks of the Giant’s Causeway, open up your minds to the sights and stories of Ireland’s mythical otherworld on a trip to fairy hill, experience what it’s like to live in a leprechaun-sized world and journey to the end of the rainbow to see if the elusive crock of gold really exists. The National Leprechaun Museum storytelling guides tailor tours for different age-groups, and their education resource packs for schools cater to all levels and are designed to tie in with as many subjects on the curriculum as possible (including English, Irish, Maths and Art and SESE History, Geography and Science), with activities to do before, during and after your visit. The school tour of the museum lasts approximately 45-60 minutes, however they suggest budgeting additional time to spend in the resource room. A 5 minutes stroll from the Spire on O’Connell Street/ Temple Bar. On the corner of Abbey Street and Jervis Street, it is located right beside the Luas (Red Line) Jervis Street stop. It is on all major Bus routes and just across the Ha’penny Bridge from Temple Bar.